New Community Workforce Development Center Director Rodney Brutton holds the certificate of accreditation awarded to the school by the Commission of the Council on Occupational Education. He’s surrounded by students and staff members. 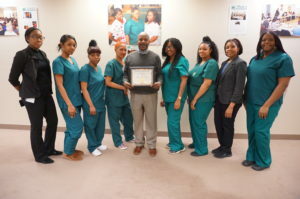 New Community Workforce Development Center has been awarded accreditation by the Commission of the Council on Occupational Education (COE), a nonprofit organization that grants institutional accreditation recognized by the U.S. Department of Education. The accreditation process is extensive. New Community Workforce Development Center began its required institutional self-study in March 2016 and submitted it to COE in September 2017. It underwent a COE team visit in December 2017 and commission members voted to grant accreditation Feb. 19, 2018. The school received notice of the decision March 14. The self-study addressed 10 COE standards, which each had specific criteria to meet. 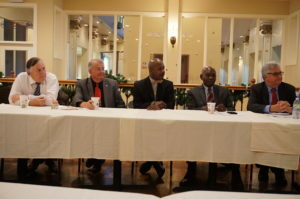 Gregory Garrett and Paul Fair, representing the Council on Occupational Education; New Community Workforce Development Center Director Rodney Brutton; NCC Board of Directors Member Dr. Zachary Yamba; and NCC CEO Richard Rohrman, left to right, participate in a breakfast meeting that was part of the Council on Occupational Education site visit in December. For the team visit in December, New Community Workforce Development Center hosted two COE representatives: Paul Fair and Gregory Garrett. Those evaluators met with New Community Corporation senior administration, Workforce Development Center instructional staff and students and toured the main building and two training centers. COE has granted accreditation to New Community Workforce Development Center for six years, the maximum length of time. The school is scheduled to go through the reaffirmation process, including a team visit, in 2023. “Receiving accreditation denotes that an institution has undergone an extensive self-study and team review process and has been judged by the Commission as meeting its Standards and Conditions for accreditation,” according to COE. COE currently has more than 500 institutional members, which include post-secondary public technical institutes, specialized military and national defense schools, Job Corps Centers, private career schools, nonprofit technical education providers, corporate and industry education units and federal agency institutions. Brutton believes cost and the location of training centers sets New Community Workforce Development Center apart from other schools. “It’s affordably priced as opposed to our competitors and easily accessible with mass transit,” he said. 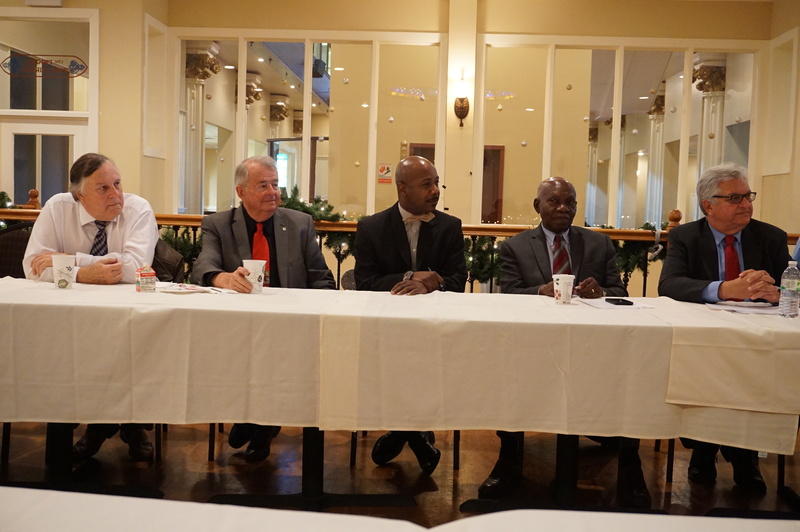 There are plans to grow New Community Workforce Development Center program offerings. Brutton said the school plans to offer a Microsoft Office Computer Specialist program and Diesel Technician program in the latter part of 2018. New Community Workforce Development Center is an accredited post-secondary career and technical school that offers the following programs: Automotive Technician, Building Trades Specialist, Clinical Medical Assistant, Culinary Arts Specialist and Patient Care Technician. There are no residency requirements for enrollment. Those interested in attending classes should click here to fill out an online application, call 973-824-6484 or visit 274 South Orange Ave., Newark.